Against the backdrop of U.S. President Trump's March 25, 2019 recognition of Israel's sovereignty over the Golan, and the 40th anniversary of the peace accords between Israel and Egypt, the Arab press, and especially the Egyptian press, published articles criticizing the Arabs' and Palestinians' handling of the conflict with Israel. The writers argued that the "all or nothing" attitude to the conflict, which has led the Arabs and Palestinians to reject every proposed solution, has caused a steady erosion in the proposals presented to them, while allowing Israel to consolidate its control of the occupied territories. They added that the U.S. recognition of Israel's sovereignty over the Golan proved the wisdom of Egyptian president Anwar Sadat's decision to make peace with Israel and thereby regain Sinai, as opposed to the folly of the peace rejectionists, whose obstinacy has left the Golan and Jerusalem in Israeli hands. Jews from 130 countries who speak more than 100 different languages have immigrated to Israel. Nearly 70 years after its founding, Israel is a technological powerhouse, in part because it is one of the most diverse places on the planet, with citizens originating in the Middle East, Africa, Iran, Asia, Europe, and North and South America, and with large numbers of Jews, Christians and Muslims. One outstanding example of this diversity is a partnership between a Jewish Israeli medic who created a revolutionary bandage and a Bedouin Israeli factory owner who employs women to manufacture it. Bernard Bar-Natan first started thinking about bandages in the 1980s, a few years after he moved to Israel from Brooklyn. When he enlisted in the medic corps of the Israel Defense Forces, he was shocked to learn that the army’s standard bandages were made around World War II and had not been modified since then. All the bandages had a pad in the middle and gauze strings on each side, and Bar-Natan was taught to grab a stone and add additional bandages over a wound to quell the flow of blood. Not only were these methods unsanitary, they required medics to carry large numbers of bandages. By the early 1990s, Bar-Natan had a prototype of a new concept. With the help of an Israeli government grant and accelerator program he launched his business, but he lacked a way to mass-produce his Emergency Bandage until he found an unlikely group to help him: Bedouins in northern Israel. Bar-Natan met Ahmed Heib for the first time in 1996. An acquaintance in the garment industry made the introduction, thinking the two could help each other. Bar-Natan needed a manufacturer for his bandage, and Heib owned a factory. Their initial meeting was awkward. On the surface, the two had little in common: Bar-Natan was a cosmopolitan Jew from Brooklyn, while Heib was a Muslim who grew up in a rural backwater, infamous for its crime and gangs. “He didn’t know who this Ahmed guy [was],” Heib says. Bar-Natan seconds Heib’s assessment: “I thought tailors were only called Mr. Cohen,” he jokes. Heib, with his low-cost business model and deep knowledge of tailoring, turned out to be the perfect partner for Bar-Natan. 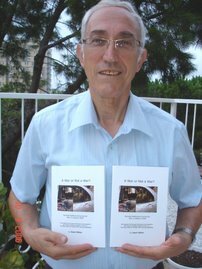 Heib initially worked with Bar-Natan through his small factory on the first floor of his house in Tuba-Zangariyya, a town of roughly 6,000 – mostly Muslim Bedouins – near the Jordan River. The more Bar-Natan and Heib worked together, the more they developed a friendship – especially after two of Heib’s children died at birth. As Bar-Natan’s company grew, so did Heib’s business. He expanded his factory to three floors capable of producing millions of bandages a year. All 50 of his employees are women. “I know that if I didn’t have this factory here, these women would not be working,” Heib says. Bar-Natan’s bandage has been a success. Today, the Australian military, the New Zealand military and most NATO countries have adopted it. It’s also standard issue for the U.S. Army, the Israel Defense Forces and the British Army. Diversity and innovation go hand in hand, Israeli innovations like the Emergency Bandage are saving lives and making the world a better place. The ancient burial caves on the outskirts of Jericho date back to the Second Temple era, and are apparently part of the extensive burial grounds of the Hasmonean palace uncovered at the site. The cave was recently exposed in the course of landscaping work carried out by local Arab farmers, who rolled tractors over the site to prepare the ground for agricultural work. Professor Rachel Hachlili of Haifa University’s Zinman Institute of Archaeology, who studied this region, identified these caves as the largest Second Temple-era burial ground in Israel. Hikers who visited the site over the weekend were appalled by what they found: Human remains were strewn everywhere on the freshly-tilled ground, the catacombs were thoroughly ransacked and looted, and the sarcophagi (burial caskets) that had been resting in the caves for over 2500 years had disappeared. Antiquities theft and destruction of archaeological treasures is rampant – in fact, it has become nearly commonplace – throughout Judea and Samaria. In this case, ancient catacombs were wiped out by illegal quarrying despite the constant stream of alerts, warnings, and documentation we sent to the Regional Commander for Antiquities in the Civil Administration, the body responsible for law enforcement in the area. Moshe Gutman, who leads “Protecting the Eternal,” adds: “The time has come for those who make declarations about their commitment to our national legacy to open their eyes to the ISIS-style destruction that is happening all around us. I call upon the Prime Minister to take responsibility. It is inconceivable that a civilized country tolerates the plunder and devastation of word cultural heritage sites. Tel Aviv University researchers have "printed"
patient's own cells and biological materials. a study in Advanced Science. BDS loses again in Airbnb Litigation! Shurat HaDin Law Center: “This is a powerful defeat for the anti-Israel boycott movement. Other international companies need to learn lessons." We just scored a tremendous victory in the lawsuit we launched against Airbnb! The online hosting platform has agreed to completely retract its policy of delisting Jewish homes in Judea & Samaria. This is an important and precedential decision in the battle against the racist BDS movement. Over the past few weeks we have been negotiating a settlement agreement with the hospitality giant Airbnb to rescind its discriminatory policy redlining Jewish-owned properties in the Judea and Samaria region. That policy, announced in November 2018, had banned Jewish property owners in Judea and Samaria from listing properties on Airbnb, while allowing Muslim and Christian property owners to list properties in the same area. Under the terms of the settlement agreement, Airbnb has agreed to repeal the discriminatory policy, thereby resolving the discrimination lawsuit. When Airbnb publicly announced its redlining policy barring rentals of Jewish-owned properties in November, it stated it would no longer agree to list these homes due to claims that such properties are located in Palestinian-owned territories illegally occupied by Israeli settlers. The plaintiff homeowners, however, dispute that contention and contend that all the properties are legal. Further, the plaintiffs asserted that Airbnb had succumbed to pressure from the extremist Boycott, Divestment, Sanctions (“BDS”) propaganda movement which seeks to delegitimize Israel and challenges its right to exist. Under the settlement agreement, Airbnb has agreed to adopt a neutral policy towards all properties in the region, allowing all homeowners to list their houses for rental on its web platform regardless of their religion, race or national origin. The Palestinian Authority has decided to penalize Palestinian civilians in need of medical assistance to avoid cutting salaries of Palestinian terrorists and their families under the so-called “pay-to-slay” scheme, which led the United States and Israel to cut aid until the PA stops inciting terror. Israel’s Diplomatic-Security Cabinet decided in February to implement a major slash in the tax revenues that Israel collects on behalf of the PA, with the amount the PA pays to terrorists and their families to be deducted from the aid Israel hands over to the Palestinian leadership. The PA paid out some 502 million shekels ($138 million) to living terrorists in 2018, according to recent Israeli media reports. The PA is using those cuts as an excuse to no longer permit Palestinians to travel for medical treatment in Israel — which costs the PA $100 million a year — while still paying in full the salaries to both imprisoned and released terrorists, as well as the allowances to wounded terrorists and the families of dead terrorists. The decision comes on the heels of the PA’s decision to cut the salaries of civil servants, 40 percent of which earn less than 2,000 shekels per month (about $535). It demonstrates the reality that under the so-called “pay-to-slay” scheme, Palestinians terrorists who have been in prison for a cumulative period of three years earn higher salaries than 40 percent of the PA’s law-abiding public employees. A Palestinian woman’s life has been saved thanks to the expert care of Sheba Medical Center, Tel HaShomer. And in an amazing turn of fate and friendship, the Israeli doctor who helped save her was once rescued by her family when he was attacked by a vicious crowd in a Palestinian village. Four years ago, Dr. Eitan was traveling with his son and made a wrong turn into a Palestinian village near Ramallah. An angry mob formed around the car, throwing stones and breaking the car windows. The lives of Dr. Eitan and his son were clearly in danger when two bystanders who lived in the village, Imad and his cousin Ayoub, rescued them. Imad and Ayoub ushered the Israelis into their home, calling for a rescue team and protecting them from the threatening crowd that closed in around the house. Without question, Imad and Ayoub saved their lives. As a result, a deep friendship was born between the three men, and now it has come full circle. When Imad’s sister-in-law was severely injured in a vehicle accident, Imad knew just who to call – Dr. Eitan. The doctor helped facilitate the sister-in-law’s transfer to Sheba Medical Center for lifesaving treatment and continues to oversee her care. Her condition is improving, and she will soon be transferred to Sheba’s Rehabilitation Hospital. This story is the latest example of Sheba Medical Center’s long history of spreading peace through medicine. This hospital without borders has a firm belief in providing the highest quality of medical care available, regardless of nationality or religion. Sane Arab voice not often heard. TThe Sea of Galilee is likely to fill up completely as the heavy snows melt on the peak of Mount Hermon through the spring. Weather that is seemingly more regular for Israeli winters has spilled into April. The good news is that this means rising water levels for Lake Kinneret, which is another name for the Bible’s Sea of Galilee and the country’s only freshwater source, according to the Environmental Protection Ministry. Lake Kinneret has risen to 316 centimeters below its maximum level, says the Globes business news outlet, citing the Israel Water Authority. According to this report, the lake is likely to fill up completely as the heavy snows melt on the peak of Mount Hermon through the spring. The lake had in recent years reached dangerously low levels. Weather forecasters say that this has been an especially wet winter after several years of much smaller amounts of rainfall and even drought. Most of all, it helps the Israel’s water supplies and the livelihood of farmers. However, hikers have also benefited from the tremendous amount of colorful vegetation throughout the country. The many previous dry winters prompted Israel to construct desalination plants. Israel currently has eight plants, with the plant in Hadera, a city in the Haifa area in the north of Israel, being the largest seawater desalination plant in the world, according to Interesting Engineering. In 2015, 50% of Israel’s water for households, agriculture, and industry was from desalination, it says. Still, experts say that desalination does not solve all of the problems caused by a lack of rainfall and even with conservation, so that Israeli authorities are relieved by the plentiful supply of precipitation this year. With Passover and then summer vacation approaching, the rains will stop, but the benefits will remain amid hopes that the trend will continue in future winters. On Saturday morning, IDF troops found two children near the Gaza security fence carrying a knife who explained they hoped to infiltrate Israel and be sent to prison. IDF troops gave the children water to drink and then returned them home via the Erez Crossing. First Campus Created for Israelis with Severe Disabilities. OFAKIM, Israel — Ayala’s eyes darted around the screen, choosing words and pictures as her teacher asked her rapid-fire questions. Ayala, 11, has a cognitive disability that prevents her from speaking. But she can communicate thanks to a screen that reads her eye movements and transmits answers to questions. With seven weeks to go, a steady stream of Eurovision contestants visit the Holy Land for filming. Ten days after Roger Waters appealed to him personally to boycott the upcoming Eurovision, Portugal’s Conan Osiris arrived in Israel to film a video clip for the competition. Osiris, who is representing Portugal at this year’s song contest in Tel Aviv, hit the ground running on his first day in Israel. He met with Israeli contestant Kobi Marimi, began rehearsing for his “postcard” video for the competition and sat down with KAN for an interview on Tuesday. “It’s what you see,” Osiris said when asked by KAN about Waters, rolling his eyes and heaving a deep sigh. “Everybody has their content, right?” That was the closest KAN got to an answer from Osiris on the topic of Waters, and the public campaign that the former Pink Floyd front man and obsessive BDS activist waged against him. Osiris – the stage name of Tiago Miranda – did not publicly respond to Waters. But on Tuesday, Waters received his reply. Osiris landed in Israel for several days of filming, touring and enjoying the country before he returns in May to compete. On Wednesday, he began shooting his postcard clip at the Dead Sea, proving he has no intention whatsoever of boycotting the competition. He met up in Tel Aviv with the UK’s Michael Rice, who was also in the country for filming. According to the National Insurance Institute of Israel, the number of civilians murdered in enemy activity - since Israel declared its independence in 1948 - stands today at 3,134. In a country with only 6.4 million Jewish citizens, this is a staggering figure. Enemy terror attacks have left 3,175 orphans in their wake, among them 114 who lost both parents, 822 widows and widowers and 926 bereaved parents. Last week, another 12 orphans were added. The father of the twelve siblings, 47 year old Rabbi Achiad Ettinger, was murdered by a 19 year-old terrorist. The other two victims of the tragic terrorist attack were two 19 year old soldiers, one of whom was killed and the other is fighting for his life. Adding to the number of bereaved parents. As the result of a grassroots campaign, the Israeli government agreed to recognize civilian victims of terror as it does soldiers who fall in the line of duty. In the 1970’s, the campaign pressured the government to pay pensions to families of terrorist victims. They also lobbied for the inclusion of a memorial ceremony for civilian victims of terror during the official state Remembrance Day ceremonies, at the Mount Herzl military cemetery. This idea was strongly opposed by the families of fallen soldiers. However, a compromise was reached in 2000 - to hold the memorial ceremony for victims of terror two hours before the ceremony for fallen soldiers. The two ceremonies continue to be held separately. Until the establishment of the official ceremonies, bereaved families erected their own memorial plaques and markers at the places where terrorist acts had occurred. They are dotted all over the Israeli landscape. 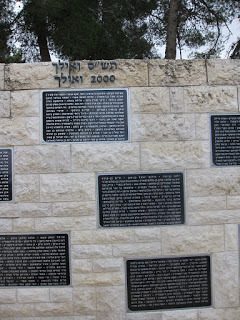 Even next to my Senior Residence complex and moshav Shoresh both situated in a corner of the Judean Hills, there is a small square with no less than three memorials – two for terrorist victims and one for a soldier killed in one of Israel's wars. In spite of the official ceremonies for terrorist victims, some families continue to set up their own memorials. My daughter was left with five children when her husband was murdered in a terrorist attack 13 years ago. 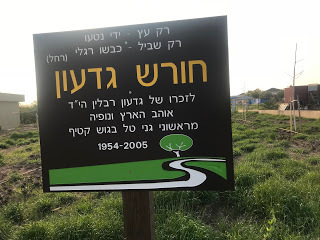 She has recently planted 33 trees in two dunam of "no man's land" adjacent to her home in moshav Ganei Tal, in memory of her late husband, Gideon ז"ל. A memorial website has since been set up which tells the story of the lives of 4,146 victims killed in enemy attacks since 1860 - the first days of Zionism - until the present day. Egyptian officials assail Hamas leaders in Gaza on Thursday night after missiles are fired at Tel Aviv during their meeting • "Even if the Israelis decide to dismantle your rule in Gaza by assassinating each and every one of you" we won't "lift a finger." Shortly after 9 p.m. on Thursday, minutes after sirens blared across central Israel and a loud boom overhead shook the area, senior Egyptian intelligence officers became outraged during a meeting with Hamas officials in Gaza. "Just so you know," they leveled at Hamas leaders Yahya Sinwar and Ismail Haniyeh, "if Israel decides to launch a comprehensive military operation in Gaza we won't do a thing to stop it, even if it decides to simultaneously topple Hamas and conquer the Gaza Strip." The dramatic exchange was relayed to Israel Hayom by a senior Egyptian official who attended the meeting. "The atmosphere at the start of the meeting was very relaxed and cordial," the Egyptian official said. "A short while before the meeting we had returned from Israel with answers. We believed Hamas would accept them and facilitate a more stable and long-term cease-fire. A few minutes later an assistant to the Egyptian delegation entered the [meeting] room with a worried look on his face and handed the Egyptian delegation leaders his cell phone. "The smiles were immediately replaced with grim faces; the delegation heads turned to Sinwar livid and told him: 'How far do you think you will get with this double game of yours? We are sitting here to hammer out the details of a cease-fire with Israel and behind our backs, you are authorizing your people to fire missiles at Tel Aviv?'" The tones grew even tenser, the Egyptian official continued. "If Israel decides to launch a comprehensive military operation in Gaza, this time we won't do a thing to stop the Israeli attack, even if the Israelis decide to dismantle your rule in Gaza by assassinating each and every one of you. While [Israel] is retaking Gaza, Egypt and its allies in the region won't lift a finger to stop the Israeli response." According to the Egyptian official, Haniyeh and Sinwar were no less surprised than the Egyptians upon hearing about the missile launch at central Israel. "Hamas is not behind the launch," Sinwar reportedly told his Egyptian guests, adding that his organization would conduct a thorough investigation to find those responsible. Sinwar asked the Egyptian officials to contact Israeli leaders and inform them that no order had been given to fire rockets at Israel, and certainly not Tel Aviv. The Egyptian intelligence officials were unconvinced and continued to assail Sinwar. "You are lying! The blood of Gazans who will be hurt in the Israeli response is on your hands! By your own hands you will bring about the destruction of Gaza and the fall of your regime, and you've also gambled with our own safety in Gaza by shooting at Tel Aviv while we are here!" Sinwar responded to the allegations, glumly telling his guests: "I won't ask you to risk your lives by staying in Gaza, but before you leave we ask that you contact your Israeli counterparts and stress to them that the missile launch was not intentional and certainly wasn't planned, and that Hamas isn't seeking an escalation but to wrap up the remaining loose ends on the cease-fire understandings." The Egyptian official added: "A short while after we left the Strip, Sinwar contacted the delegation heads and told them that Hamas operatives carrying out maintenance duties near the launch batteries placed in western Gaza, in preparation for a future clash with Israel, apparently fired the missiles mistakenly. According to Sinwar, Hamas detained one operative and promised to detain others and bring them to justice." Hamas also acquiesced to the Egyptian demand that it cancel Friday's "March of Return" border demonstrations, which it conducts weekly, and that its so-called "March of a Million," planned for late March, either refrains from violence or is also canceled altogether. What are those starry-eyed religious newlyweds doing on the stage of the 2019 OurCrowd Global Investor Summit – Israel’s largest hi-tech gathering? Isn’t technology about cybersecurity, digital FinTech, cloud mobility? The truth is that both Adir and Liat Grainer Siman Tov from Hod Hasharon might have attended the summit anyway. With 18,000 potential investors and investees from 187 countries at the Jerusalem International Convention Center, the summit is attractive for young Israelis who, like Adir and Liat, served in the IDF computer world and are now employed in technology. But on stage they are demonstrating one of the achievements of Israel’s industry: a stand-up wheelchair by a Yokne’am-Illit-based company called UpnRide. Six-and-a-half years ago, then-IDF soldier Adir was paralyzed from the chest down. Confined to a wheelchair, his dream was to stand – not sit – under the wedding canopy. Israeli ingenuity came to the rescue. UpnRide, a robotic standing wheelchair, was designed by Amit Goffer, a mechanical engineer who also became paralyzed in an accident. He first designed ReWalk, the exoskeleton which has helped paraplegics walk. UpnRide, which works for quadriplegics, takes mobility much further. UpnRide isn’t at the summit merely to showcase its success. It is looking for the right investors to increase the company’s forward mobility, too. No one can question the good of UpnRide. The advantages of a standing wheelchair seem obvious – letting quadriplegics see the world at eye level, and with a single push of a button change their world by allowing them to stand and sit at will. The robotic device is able to navigate on indoor and outdoor surfaces without tipping. Which brings us back to our beautiful young couple. Adir and Liat Siman Tov. They met on a dating app, not surprising for two techie young people. Adir was already paralyzed. They dated for seven months, but Liat says she knew he was “the one” from their first date. She was looking for someone who was smart, interesting and religious. She wanted to be able to laugh with her husband and to feel “she was home” when they were together. “When he proposed, I said yes right away. I love him. He’s extraordinary,” she said. She was 26 and he was 27. She knew he very much wanted to stand at the wedding; but every time she asked him how he was going to accomplish this, he changed the topic – even on the phone the day before the wedding. He didn’t tell her that 40 days before the wedding he wrote to UpnRide and told them of his dream. They invited him to the company to see the product. Liat was sitting in the bride’s chair, accepting blessings and praying. Around her, friends were singing quietly when she saw a group approaching her. “I looked for Adir and saw him standing taller than anyone else. My heart was beating so hard I could hardly breathe. His face is always glowing, but it was glowing more,” she said. “My heart was beating fast, too,” Adir says. He approached Liat, and they exchanged knowing, loving glances as he lifted the veil, and the wedding went forward.